Following a successful show as the sole act supporting Eric Clapton at the Lanxess Arena in Cologne, Floy has been on Hamburg radio ahead of the next concert tonight at the Barclaycard Arena in Hamburg! Listen to the interview on ROCK ANTENNE and NDR below – and sign up to be the first to know when the new album is released! Find Floy in DIE BILD ZEITUNG today! The countdown to supporting Eric Clapton next week has begun. Floy and her band The Messengers have been announced as the opening support act for Eric Clapton in Cologne and Hamburg! 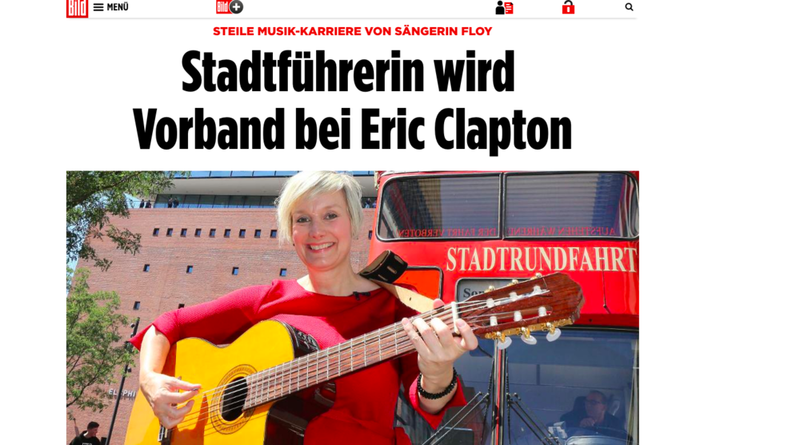 Eric Clapton is returning to Germany after four years and will be performing 2nd July 2018 at the Lanxess Arena in Cologne and 3rd July 2018 at the Barclaycard Arena in Hamburg. Floy will be performing original material to warm up the arena audiences – and get the party started – for Clapton, one of the best guitarists of all time. THE NEW FLOY ALBUM IS IN THE MAKING! The new album will range in style from silent and intimate moments to explosive outbreaks of emotion, exposing Floy`s impressive vocal range which has often been associated with the voices of the gospel- and soul singers of the 60ies era, such as Mahalia Jackson, Aretha Franklin or Janis Joplin. On this album Floy will sum up the results of her writing of past years, which was inspired by her life in places around the world such as the US, the UK, the Middle East and Portugal. By also playing rhythm guitar (nylon string acoustic), Floy takes a lead in the performances, making sure that the new program has a much deeper personal touch than ever before! Together with her new band THE MESSENGERS (Hannes Hoffmann/ drums and percussion, Jonty Banks/ vox and bass, Tom Ferko/ keyboards) as well as further fellow musicians contributing to the recording work such as Susanne Vogel, Lars Hansen and Ladis Cimzek, the album is presently being produced by Hannes Hoffmann at Spalding Studio, Hamburg.